For 70 years, from 1946 to the present, race enthusiasts of New England have participated in and watched events at the Hudson Speedway. Located in northern Hudson at what is now the corner of Robinson and Old Derry Roads is this 1/4 mile short oval asphalt track banked at 12 degrees. It was initially a dirt track and by 1953 it was paved. Often times the racing schedule called for 11 individual races during a Sunday afternoon or evening. At one time as many as 4,000 race fans were reportedly on hand for these events. Some Hudson amateur, and not so amateur, drivers participated in events using stock cars they themselves modified and painted for the occasion. Local race fans Gary and Lorna Granger and their friends Bertha and Richard Ashford drove their cars (#68 and #69) at this raceway and the sister track in Epping, NH. 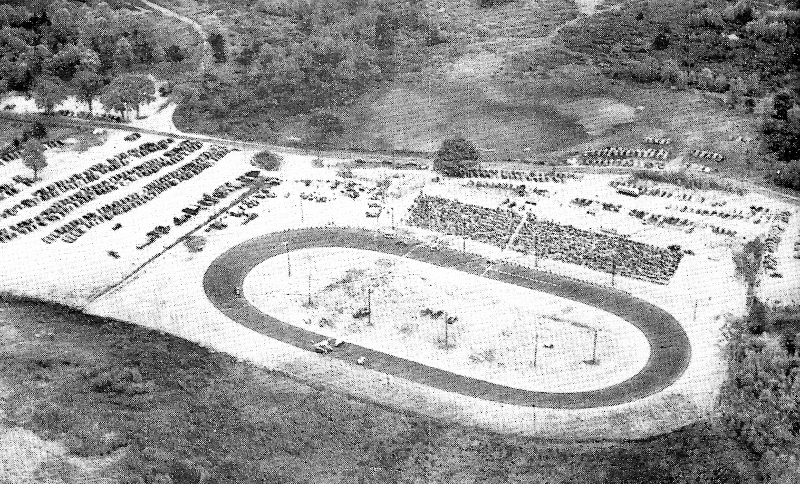 Stock car races were of several types: sportsman, modified, demolition derby, powder puff, and spectator races. This current 2016 season the racing schedule runs from May to October. The neighborhood and roadways around the Hudson Speedway have changed significantly these past 70 years. Before the early 1950’s the part of Derry Road (Route 102) from Old Derry Road just beyond the Hills House to the Londonderry Flea Market had not been built. The road we know of as Old Derry Road was The Derry Road. Robinson Road ended at what is now Old Derry Road at Potash Corner near the Senter Cemetery. There was an unnamed cross road from this corner to the Litchfield line. The intersection of Robinson Road, West Road, and Derry Road at The Irving Station and Dunkin Donuts did not exist. The neighborhood was rural; Nadeau Dairy Farm, Jasper’s Poultry Farm to the south. On the north towards Londonderry there were there were 2 or 3 houses between the cemetery and the Londonderry line. The property on Old Derry Road between the speedway and Putman Road, where some 6 houses now exist, was undeveloped and one family lived there. The property was later owned by the town of Hudson for unpaid taxes and in 1955 sold at public auction and by 1971 again sold to a local developer. By the mid 1970’s there were some 6 families living adjacent to the speedway on Old Derry Road. Local property owners were issues seasonal passes to the speedway events. With the increase in residency and continuation of the racetrack activities conflicts occurred and the local residents organized to seek regulations of the speedway. The speedway had been in existence for about 25 years before this occurred. The issues centered around noise, crowd and traffic control before and after races, litter along highway, and even trespassing on private property. Neighborhood fields were used for parking with property owners charging for parking; the hours of races were controlled so there were no evening races when school was in session the next day. To this day, Sunday races continue. To some of the residents in the area it is part of our neighborhood activities; to others, I am sure, the noise and activities is more that just an inconvenience. The photo shown here is from an early postcard with the photo by A. Dallaire of Manchester, NH. It is an aerial view looking west to each over the track. Old Derry Road (Derry Road) is behind the bleachers with a field of the Nadeau Farm across the way being used as a parking lot. The post card was a recent donation to the Historical Society’s collection. By Ruth M Parker in Derry Rd, Rural, Uncategorized on September 9, 2016 . Were you a driver or in the audience?